Airplane seat assignments have gone the way of free checked luggage and in-flight meals, as major airlines shift from selling all-inclusive tickets to an a-la-carte business model, offering seat selection at an added cost to consumers. While airlines reap the benefits, customers say the move creates confusion and unfairly penalizes families with children who want to travel together. United Airlines, Delta Air Lines and American Airlines -- known as the big three -- now offer discounted fares in Basic Economy class that don't come with seat assignments to compete with low-cost carriers including Allegiant, Spirit and Frontier airlines, forcing travelers to pay up for seat reservations. "Airline executives will be very honest. They aren't offering Basic Economy because they want people to buy Basic Economy. They are offering it because they want you to pay up the higher fare. That's the whole purpose of the construct," said Samuel Engel, an airline consultant who leads ICF's aviation group. The big three also charge passengers a fee on top of airfare to reserve "preferred" seats, characterized as such for their cabin location. Seats toward the front of the plane, as well as window and aisle seats qualify, while unpopular middle seats and seats located in the plane's rear don't usually incur fees. "Seats are real estate, and real estate on an airplane is a very precious commodity," said aviation consultant and IdeaWorks President Jay Sorensen. "Airlines have applied a heat map to the seat selection process based on which seats are most popular, and they view it as an opportunity to charge extra," he said. Try booking a seat on Delta flight DL898 from New York's Laguardia to Detroit Metropolitan Airport. 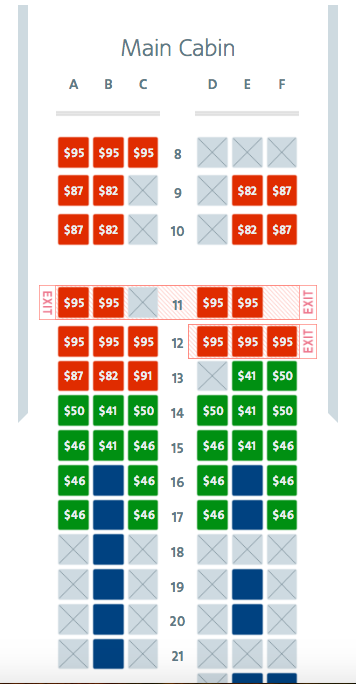 Seat 16D -- on the aisle near the front of the main cabin -- will cost you $59.99 more than 16B, located in the middle of the row. Same goes for 16F -- a window seat -- while window and aisle seats toward the back of the plane don't come with added costs. Sorensen touted the upsides of the new model. "It allows a consumer to choose a bare-bones product or to spend more money for more comfort and convenience," he said. "At one point a decade ago, you could post a price and that price included everything a consumer could reasonably expect. But what has happened since is as you go through the booking path, you are picking and choosing things. It generates more revenue." United President Scott Kirby likened paying more for seats toward the front of a plane to shelling out for prime seating at concerts and sporting events. "What's so special about 'premium seats'?" But customers are frustrated that they have to now pay more for marginal gains -- like aisle and window seats -- versus extra leg room. "@Delta Wow. Had no idea that 'preferred' seat was code for regular seat. My bad. Please cancel and refund my other purchase," Chris Hamm tweeted, after realizing he had upgraded to what he considered a standard seat on a flight from Atlanta to San Jose, Costa Rica. "Asked #AmericanAirline what's so special about 'premium seats' that they want me to pay $99 extra on check-in. Their reply? 'Thank-you for your feedback'," a user named SallyD tweeted. She complained that seat 26D -- located closer to the front of the aircraft -- cost $99 more than seat 33D, to which she was assigned. Analysts say consumer frustration is all a part of the transition. "Anytime you change how something is sold or how it's defined there's going to be a rough period where consumers are impacted by the change," IdeaWorks' Sorensen said. "In terms of seating, we are in the middle of that right now." Airlines are also finding money by forcing big broods to pay extra to secure side-by-side seats -- and are being accused of profiting from splitting up kids and their parents. Consumer advocate Charles Leocha equated the airlines' move to President Donald Trump's policy of separating families at the U.S.-Mexico border in a blog post titled, "Family separation: It is an airline problem, too." "This is a cruel form of family separation and it is done on a daily basis on airlines with visions of profits dancing in front of the airline-executives' eyes," he wrote. He argued that a family of four could rack up to $800 in extra fees just to sit side-by-side on a domestic flight. Families wanting to sit together face an additional hurdle under the new pricing model: Customers who have paid up for preferred seats are less inclined to move to accommodate separated families. "People who would normally be able to move around now feel very entitled to the specific seats they chose for their own comfort because they paid extra money for that specific seat," Leocha said. Congress in 2016 passed a law requiring that airlines seat families with their children under age 14 at no additional cost to travelers. But the Department of Transportation has failed to enforce it. Ancillary revenue -- anything that's not included in the core ticket price -- is expected to reach $92.9 billion globally in 2018, up from $82.2 billion in 2017, according to data from IdeaWorks. Last year, baggage fees made up the bulk of that revenue, with reserved-seating fees coming in second. "[Reserved-seating fees] are attractive to airlines because technology powers it. With food, for example, [airlines] have to purchase food. With baggage service, you have to provide all sorts of support, which involves labor," Sorensen said. "But the costs associated with seat assignment services are relatively low."